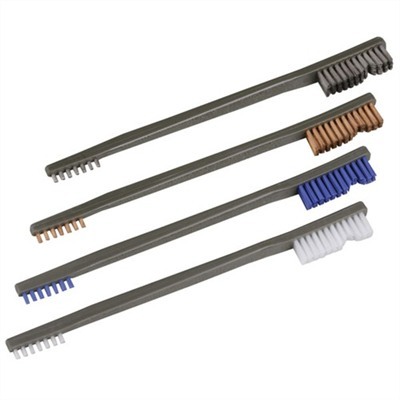 Nylon, bronze or stainless steel bristles means you will always have the correct brush on hand even for the toughest cleaning requirement. Flexible, double-ended design is best around in the shop; can be put to dozens of uses cleaning, polishing and restoring. Blue or white nylon takes care of fresh carbon or powder residue inside or out but won’t scratch your firearm’s finish. Extra-gentle white nylon is also perfect for cleaning delicate wood surfaces. Bronze cleans more stubborn residue on metal surfaces that require more aggressive scrubbing action like inside slides, receivers or locking lugs. Stainless steel is best for aggressive cleaning of fouling other brushes won’t touch. Use stainless steel on interior surfaces only because it will scratch and mark most gun steels and finishes. SPECS: Polymer handle, 7” (17.8 cm) long. Single row bristles on small end, triple row bristles on large end. Variety Pak contains one (1) each stainless steel, bronze, and white nylon brush.